A moped spews more filth into the atmosphere than an 8-cylinder SUV. One study found that these tiny vehicles generate amounts of pollution “several orders of magnitude higher than the limit values admissible in Europe and the USA.” As the study authors put it, “Waiting behind a moped in traffic may, therefore, constitute a considerable health risk.” Not good. To help rush-hour victims breathe easier, Dutch designer Ronald Meijs has created the Motorman, an electric “moped” that’s become the fashionable green machine for daily commuters throughout Europe. Motormans have been spotted on the cobbled streets of Amsterdam, Ibiza, Düsseldorf, Maastricht, Zurich, and Brussels; enough E.U. cities to fill a Jason Bourne itinerary. 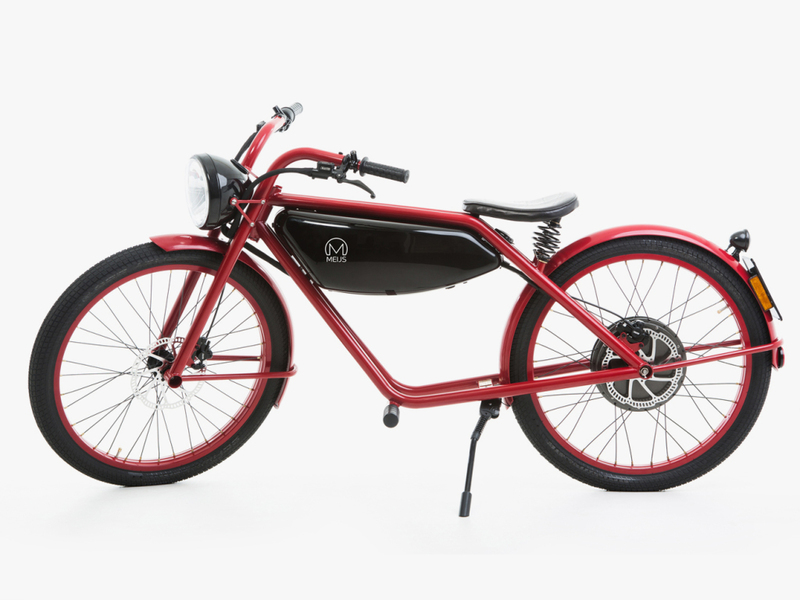 The Motorman may fit the legal definition of a moped, but it has no pedals. The drivetrain is fully electric. No human power required. Tech-wise, though, this is no Tesla. The 2kw engine won’t allow you to do burnouts or evade the polizia. There’s no iPhone charger, blind spot detection sensor, or autonomous driving mode. Not even a lousy cup holder for your macchiato. That “fuel tank” holds a lithium polymer battery, the ideal choice for light EVs because of its high power density rating. That translates to some respectable specs. Range: 43 miles. Top speed: 28 mph. Charging time: 6 hours. Not road trip numbers, but ideal for office drones who like the idea of lowering their carbon footprint without breaking a sweat. The Motorman is also maintenance-free and economical to operate: less than two cents per mile. That may help soften the blow of the sticker price: $5,158 for the base model (available in Jet Black or Ruby Red). This being Europe, tack on another 21 percent for the V.A.T. Options, like Bauhaus paint jobs, leather saddlebags and custom logos, will pad the bill further. Which only proves that not every Dutch treat is cheap. The Motorman is currently available only in European Union countries (+Norway and Switzerland). It will be available in North America within a year.